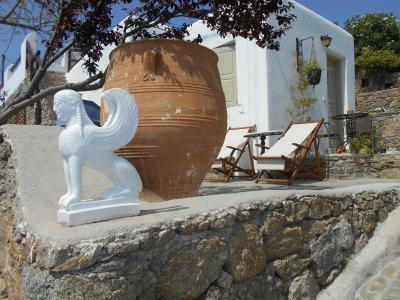 Lock in a great price for La Veranda of Mykonos Traditional Guesthouse – rated 9.2 by recent guests! The view was amazing and the staff were very helpful. It was great that they collected us from the ferry when we arrived, and dropped us to the airport too when we left. Hosts couldn't be more accommodating. Fetched us from the airport on arrival and dropped us off at the port for no extra charge. Was a bit of effort up the hill but the view was worth it. Location and grounds were beautiful. Host picked us up and dropped us off at ferry port. He was very nice and polite, nice touch. 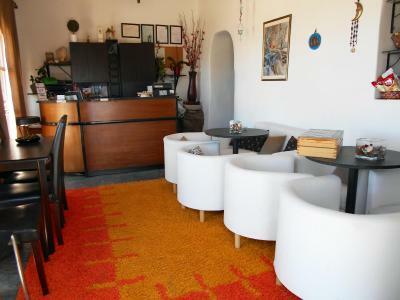 The location of this property was right next to a popular bar called 180 degrees. Everyone goes there to watch the sunset, but we were privilaged to the same view at our hotel. The sunsets from the hotel were incredible each night. Each room had it's own patio to sit on to watch. 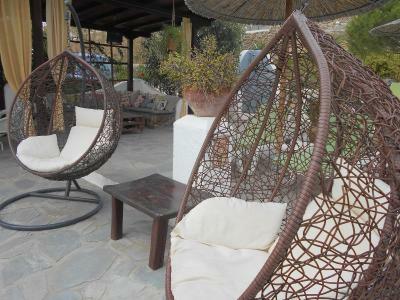 There was also a nice sitting area near the lobby to look out from too. The free transportation to and from the port were much appreciated. The room was very spacious with a kitchenette. There is a grocery store just up the hill from the hotel. 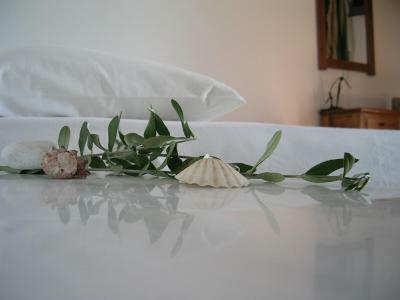 The bed was the most comfortable bed during our two week stay traveling around Greece. They were also helpful arranging a ATV to rent. 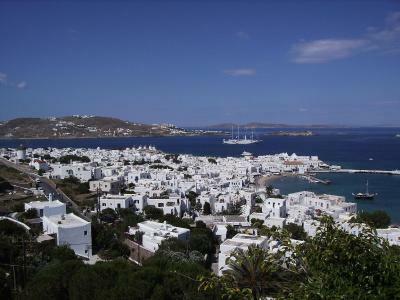 The location is close to Mykonos town if you don't mind the steep hill getting up. We didn't mind the hill, but be warned it is VERY steep. The view overlooking Mykonos town is great and the pool is really nice too. 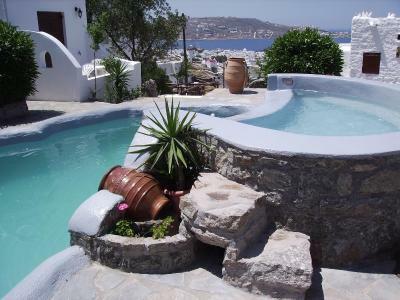 I didn't really need a pool because I'd rather spend my time discovering the beaches/Mykonos, but it's there for people who like that. 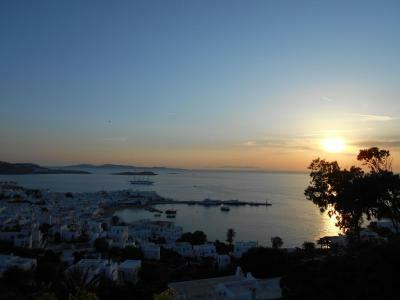 The view on Mykonos from the hotel is great. The swimming pool and the deck chairs are a plus. The room was nicely decorated and unique. 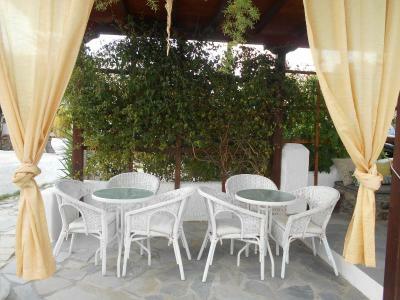 Great private patios for each room. This hotel was amazing. It had amazing sunset views and the staff was very nice! Enjoying views of the Aegean Sea and sunset, La Veranda features a small, free-form pool with sun beds, as well as an outdoor bar. 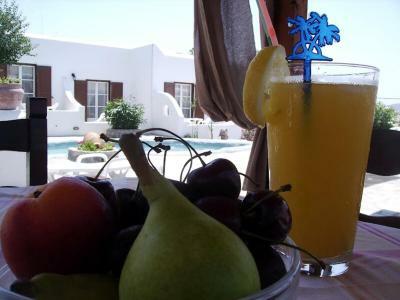 It offers air-conditioned accommodation with a furnished patio or balcony overlooking the Aegean Sea or the pool. 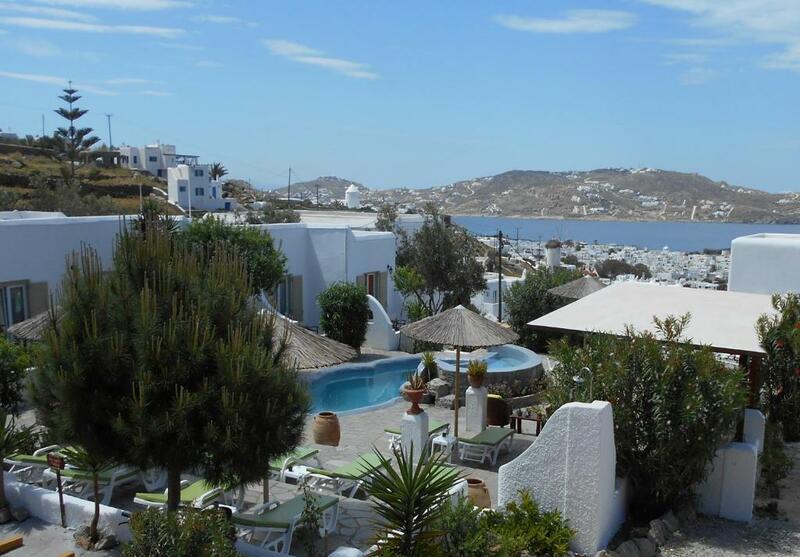 Decorated in different styles, each unit at La Veranda of Mykonos includes a flat-screen TV, CD player, small fridge and kettle. Some accommodation types offer cooking facilities for guests to prepare a quick meal. 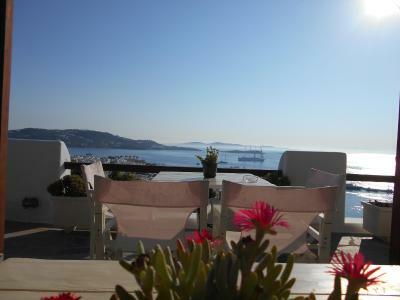 Guests at La Veranda can order breakfast or drinks at the bar overlooking Mykonos Town and the Aegean Sea. 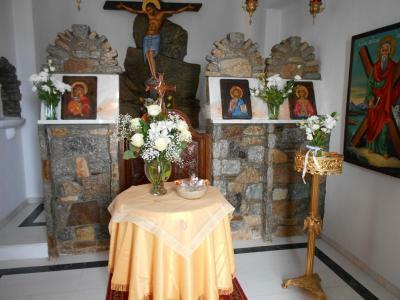 A private chapel available for weddings and other ceremonies is featured on site. 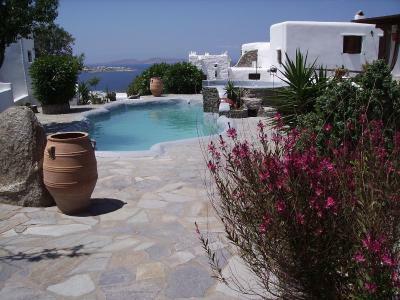 The stone-paved sun terrace surrounding the pool offers relaxing moments. Free WiFi is available to use at La Veranda Cafe and the reception areas. 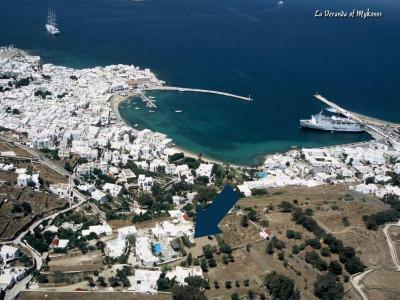 La Veranda lies 1,000 feet from the centre of Mykonos Town and 2.5 miles from Mykonos International Airport and Port. The famous Super Paradise Beach is around 3.1 miles away. Free parking is possible on site. 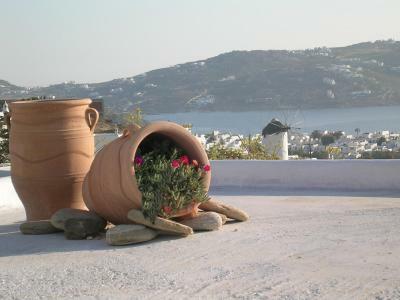 When would you like to stay at La Veranda of Mykonos Traditional Guesthouse? 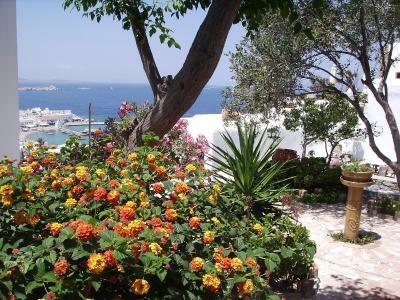 Opening to a shared, furnished terrace, this air-conditioned room enjoys Aegean Sea view. It includes a TV, CD player and fridge. 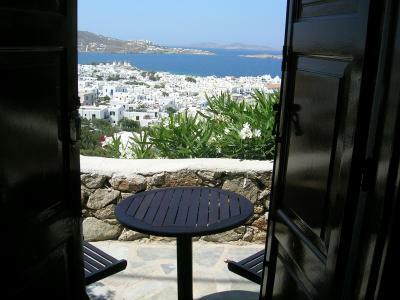 Built in the rock, this air-conditioned room opens to a furnished patio wide side views of the Aegean Sea. It is fitted with built-in bed and beamed ceilings and includes a TV, CD player and fridge. Opening to a furnished balcony with pool view, this air-conditioned room includes a TV, CD player and fridge. Featuring a kitchenette with fridge and coffee maker, this air-conditioned studio opens to a furnished balcony with pool view. It also includes a TV and CD player. This twin room has a private entrance, air conditioning and CD player. This suite features a stovetop, dining area and DVD player. This double room features a CD player, tile/marble floor and patio. 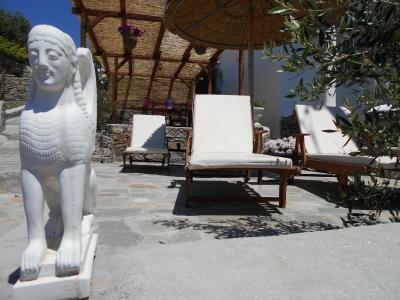 House Rules La Veranda of Mykonos Traditional Guesthouse takes special requests – add in the next step! 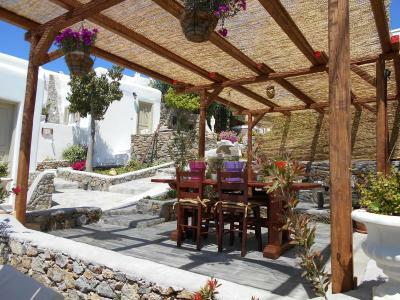 La Veranda of Mykonos Traditional Guesthouse accepts these cards and reserves the right to temporarily hold an amount prior to arrival. When booking nonrefundable rates, please note that the credit card used to make the reservation is required upon check-in with a valid ID of the card holder. If this is not possible, guests are required to contact the property by email before arrival. Please note that free transfer upon arrival is available daily from 08:00 to 20:00. Free transfer upon departure is only available during fixed hours. Private shuttle service can be provided upon charge and on request. Kindly contact the property 36 hours prior to arrival to arrange check-in and transfer details. 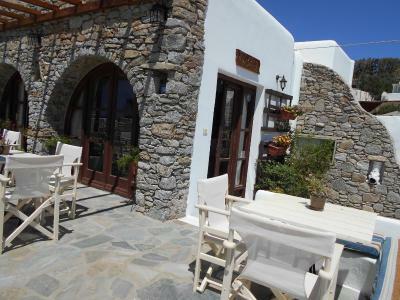 The property is located on the hill of Mykonos Town and is accessible by walking up the hill and several stairs which may not be suitable for guests with mobility issues. Please check google maps for the exact location and the photos before you proceed with a reservation. Access with a vehicle is possible within the premises at the unit's parking lot. Please note that charges may be applicable for early check-in before 08:00 and late check-in after 20:00. Kindly note that the reception operates from 09:00 to 23:30. 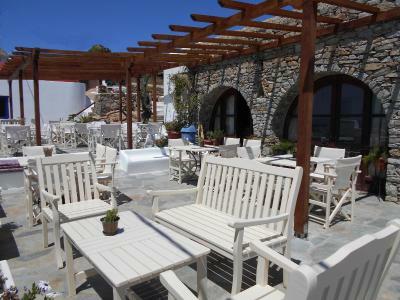 The breakfast area of the hotel was great, we had there the best Greek breakfast of our lives. The price of it is also very good, you get a lot of delicious food for around 10€ per person. I also attached a photo of the food and the view. The hotel staff are delightful. All genuinely friendly and happy to help with all the infos that we needed, at any time. All respect for the owners who do a great job, an excellent hospitality! It is true that in order to get to the hotel you have to “exercise” a bit, but trust me that all the effort is worth it. The view is really amazing, the famous 180 degrees Sunset Bar is right next to this property, so it is basically exactly the same view. The sunsets are absolutely breathtaking. 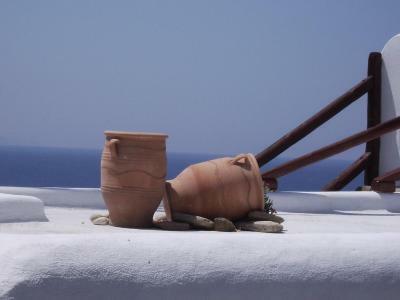 This was not the first time we travelled to Mykonos, so we had experiences with other properties, which were also nice, but this one was the most special one. 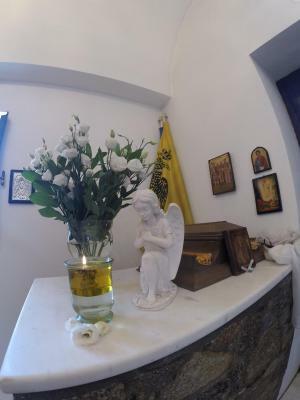 You can feel the Greek atmosphere here - the way the whole place is designed, the food and especially the hosts, who even teached us some Greek words. We hope to be back for a longer visit in the future! The bed was too low and the shower was up a few stairs and hard to get in and out of. Our room was very small, with difficult access to get in and out of bed. Also no room at all for suitcases to be opened. We also had a bit of a problem with mosquitoes. Wi-fi was very poor also. Stunning location and view. 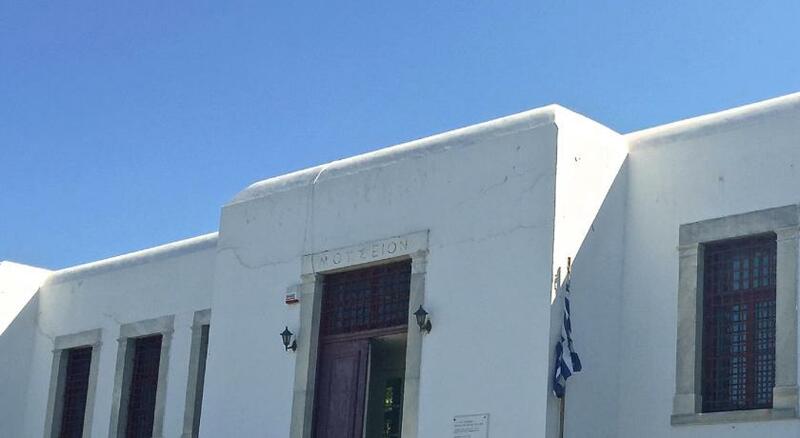 Easy walk into Mykonos town. Lovely pool area. Perfect for watching sunsets. Everything was perfect. From Andreas meeting us at the airport to us leaving. Marina and Andreas were perfect hosts. Everything from room, breakfast, surrounds, view(to die for) was everything and more. The hosts were very friendly and accommodating. The view was outstanding. Toast (with cheese and turkey) was the best. The owners are so lovely kind and helpful and can’t do enough for you. Andreaus collected us from the airport and took us to the ferry for our onward Island hop journey, thank you again! 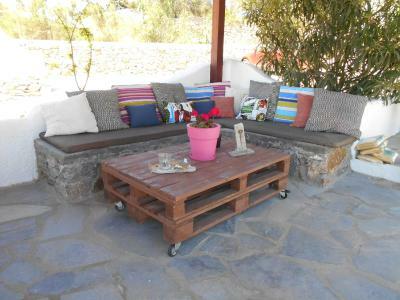 The pretty guest house is perched on a hillside, the reward is fab views and glorious sunsets. 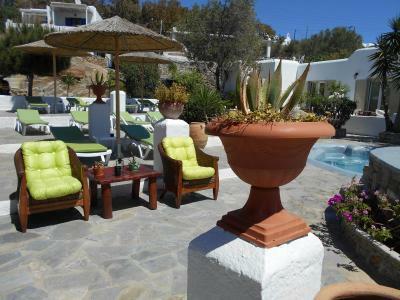 The pool area has plenty of quality sunbeds and is beautifully landscaped with shaded seating areas and funky chairs. Pool towels are available. 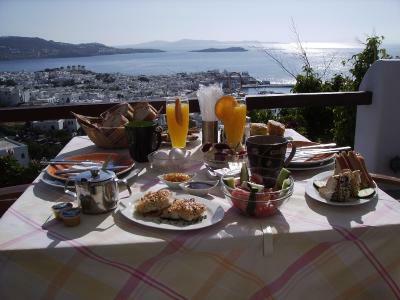 Breakfast and snacks are to order, dining is from an open patio area once again with amazing views of Mykonos, the harbour and surrounding Islands. The room was very nice, comfy bed and pillows, great shower, fridge, kettle, free safe and super WiFi. There was nothing here we didn’t like it was great! La Veranda location is exceptional . Andreas and Marina, the owners were very welcoming. We were offered free transport from the airport on arrival and down to the port on departure. 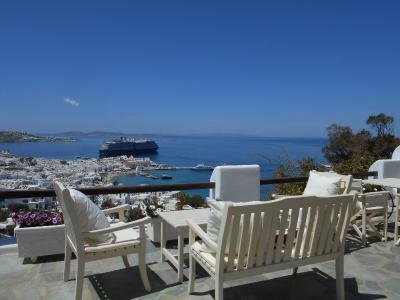 The property has wonderful views of Mykonos town, sea and port. 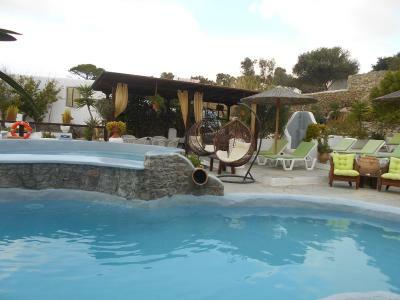 The garden and pool areas were well maintained and in harmony with the surroundings. 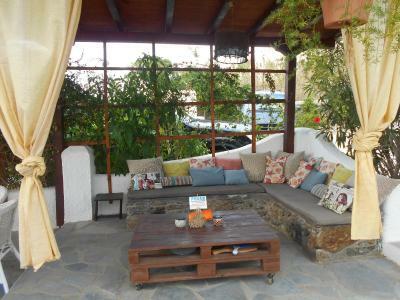 Lovely terraced areas to relax always with stunning views. Very peaceful. 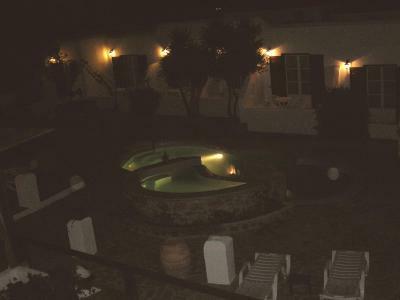 Our room with a small balcony had views of the pool , garden, sea and town and the added bonus of a small kitchenette. Being in a small family run pension was just perfect. We hope to return soon. A big thank you to Andreas and Marina. We loved our stay here and we were sorry to leave. 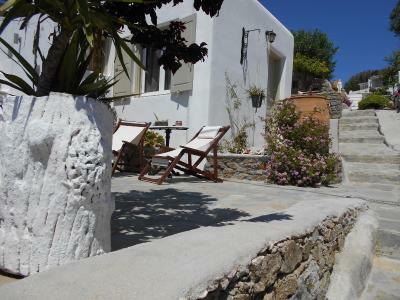 Marina & Andreus have a lovely guesthouse and they do everything they can to ensure you enjoy your stay. 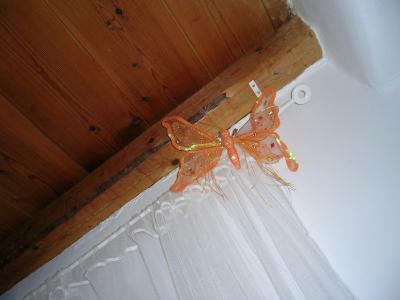 The rooms are a good size, the bathroom was spotless with a great shower. We loved our room being next to the pool. The garden is very pretty and there are so many places to relax. 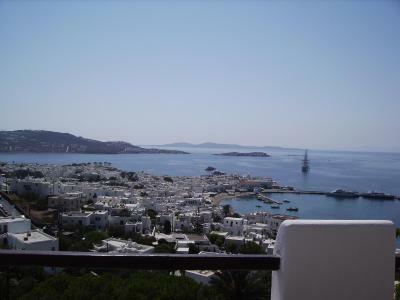 The view over Mykonas town is fabulous. The walk into town is about 5 minutes. 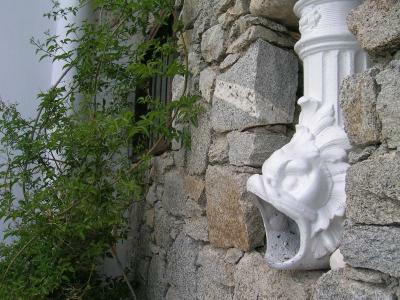 Marina can arrange trips including to Delos (marvelous) and although there is no onsite restaurant they can arrange delivery of nice food from town at very reasonable prices. The guest house has such a relaxied feel it's just perfect. Bathroom is a little tight and could do with some work. 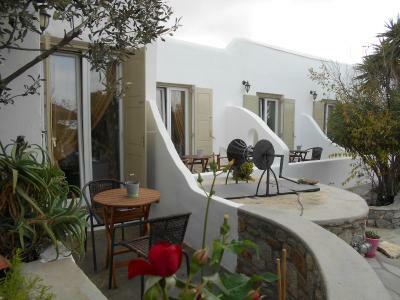 Well maintained property, stunning views of the sunsets (we sat and enjoyed each night with a wine/beer and some nibbles from the supermarket just up the hill) before heading out for dinner. 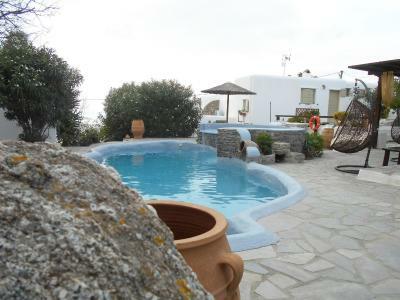 Nice pool and loungers, and husband and wife hosts were very accommodating. Would definitely stay again. Good bakery (Casa Dolce) and restaurant (Oregano) just up the hill as well. Our room had kitchenette, very tight, outdated, very old drip coffee machine, no supplies of any kind. Not worth getting this room. Our friends had larger room with fridge and kettle. Their room was better and cheaper. 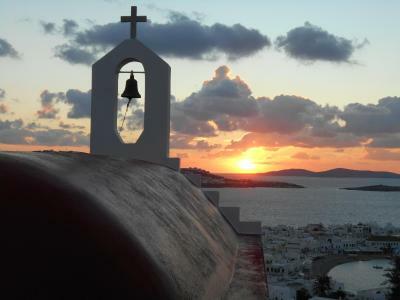 The view from the hotel is INCREDIBLE - looks out over the whole of Mykonos town, perfect place to have a beer at the end of the day and watch the sunset. 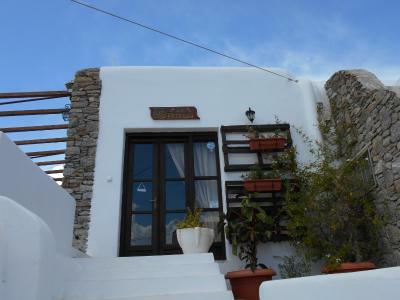 Location is ideal - only 5-10 minute walk down to the main town area (slightly longer on the way back up!) so you're close enough to the main 'hub' but far enough away for lots of peace and quiet! Room and bathroom were very clean, plus the pool area was lovely with lots of places to sit and relax. 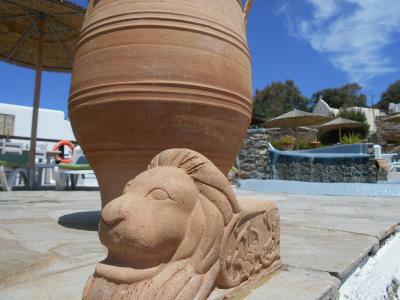 The owners are very friendly and will do whatever they can to make your stay as enjoyable as possible. Really lovely to have the free pick up from the port. Can't recommend this place enough - we will definitely return! Staff were amazing and friendly. The free transport from the Port to the accommodation was extremely helpful. The views from the property are breathtakingly beautiful. I am a total coffee fiend so had to head to town every morning for my fix. It is only a 5 minute walk though so not terrible! And Popolos makes a great espresso. My friend and I stayed for 3 nights at the beginning of our holiday in Greece. Our hosts were accommodating, friendly, informative, and easy to communicate with. 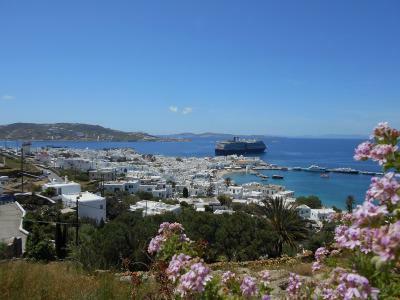 After a 28 hour commute we were picked up from the airport, provided information about Mykonos town (which is in easy walking distance, 5 mins max), and were able to collapse in comfortable beds. Totally rate the pillows! 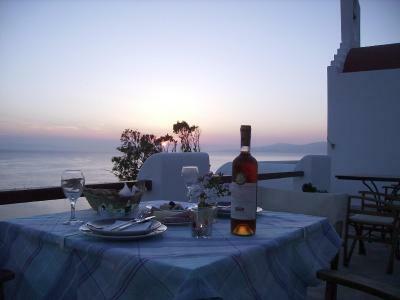 The sunset view from the veranda is excellent and it is accompanied by chilled music from the sunset bar above. Important to know that the music from the bar did not go through the night, it finished early, by the time we were back from dinner. 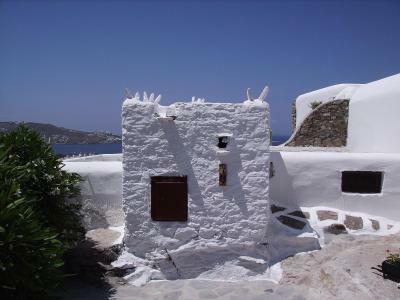 The location is very convenient, flat soled shoes are a must though as the path to Mykonos town is a bit steep. Great stay, would definitely return.